Since I'd like to put the top end together this weekend, I've turned my attention to getting the heads ready. The heads are perhaps the most unique & exotic parts on the engine. Note the chamber shape, and the fact that it's much more flat than any XL or Buell. The valve angles have been stood up a lot to allow this. The valves are titanium - 1.750" exhaust and 2.250" intake, which is some big honkin' valves! They're featherweight though. Notice that they're 5/16 stems, not the fashionable 7mm stuff. Also note the spring pack. It's a conventional dual spring, not a beehive. I've done the measurements and while I'd rather not reveal the exact numbers, they're pretty stout. Likewise they have lots of travel at the lift I measured earlier when mapping the cams. Retainers and even the valve locks are titanium. This is all top shelf stuff. The exhaust seats are beryllium copper and the intake seats are bronze manganese, to be compatible with the Ti valves. I just freshened everything up and made measurements to make sure everything is good to go. It was all in very good shape and I didn't need to swap any parts. But now I have all the numbers on everything in case I ever need to go buy parts. Now that's an ovalized port! It's also very straight, which is the real advantage of standing up the valve angles. The ports were CNC machined from the factory and pretty well done. We didn't really make any big changes, just cleaned up some sloppiness here and there. The rocker box is integrated into the head, it's all the same piece. On top of that, two of the head bolts (actually head nuts) are inaccessible without removing the rocker arms. So that begs the question, how do you put this thing together? The lifters are hydraulic and the pushrods are non-adjustable. The only way I can figure out to do it is to disassemble and drain the oil out of all the lifters and then reassemble and install them. Then torque the heads on. 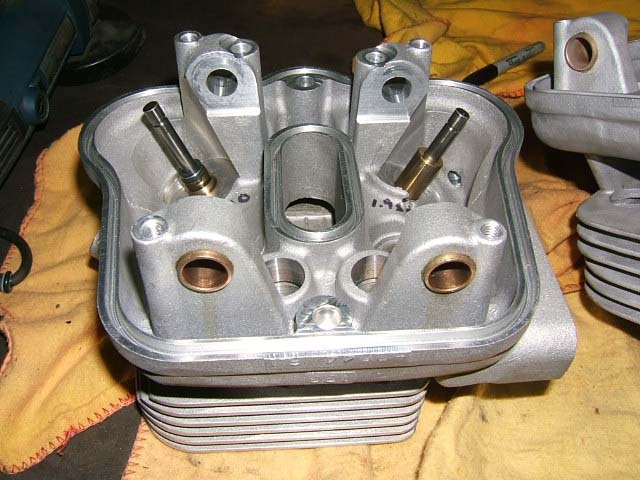 Install the pushrods and the rocker arms into place and then push the rocker arms down, compressing the lifter, while putting the rocker shaft through. I don't see any other way to do it. The magic marker writing is where I wrote the spring installed height measurements, before shimming. Using that data and the spring pressure and coil bind height measurements I can figure out how much I want to shim each spring. Great post, really good info and pictures, thanks.... The finning on the heads is huge and the valves are giant with their narrow included angle, isn't the bore just a tad over 4" ?? I set this project aside for a couple weeks because the other bike is higher priority. I need to get them both done before the Bub meet but the nitro bike has to come first, as Susan can ride her S1 if the XBRR isn't ready, but I need the nitro bike for myself. The frame on the nitro bike cracked last year, and I've been working on the XBRR while I got the nitro bike's frame sandblasted/welded/gusseted/powder coated, but now that the frame is all fixed I'm putting that bike back together. I should get back to the XBRR in a couple more weeks. Stephen, yes, it's a 4.080 bore x 3.125 stroke. The valve angles have been stood up dramatically - 20 intake/25 exhaust vs. stock 27 intake/31 exhaust - which allowed them to raise the ports quite a bit. It also helps with valve to valve clearance which is why they can use such huge valves. But to do that to an XL engine would require a major change in the valvetrain - like massive relocation of the rocker arms. Altered valve angles in XL motors leave the valve tip in the stock location, or close, so that the stock valvetrain still works. 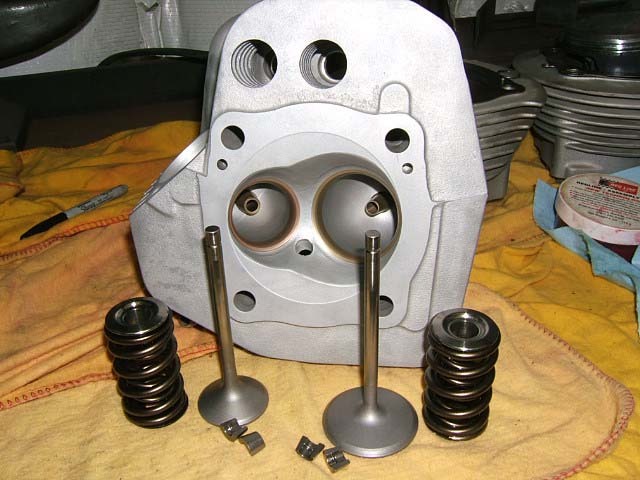 Aaron looking at the aspects of the XBRR, bottom end, bore/stroke ratio, porkchop flywheels, the heavy finning ect..... Would you consider this the pinacle of aircooled twin cylinder race engines? I know it had a short race career, racing against water cooled four valve twins was nigh on impossible I guess ??? If you could would you have designed it any differently ??? Wow!! This is some great stuff! 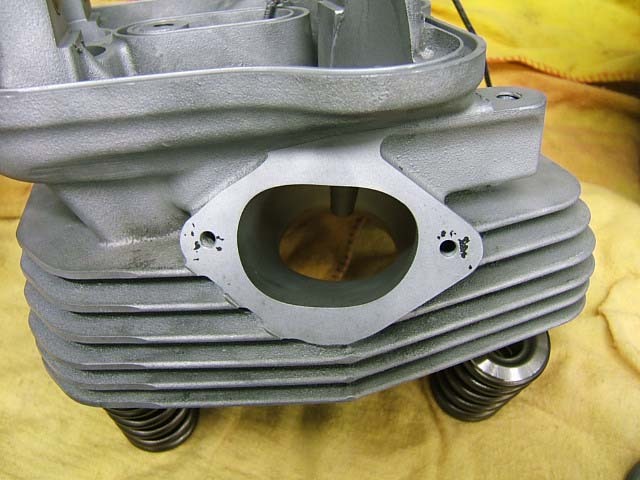 Magnesium case, flywheel, cams, heads, valves, built in oil pump, and lots of special tooling. What do those rockers look like??? Neat neat neat neat neat NEAT! STUFF!, as they say, a pic is worth a thousand words, thanks for pics aswracing. Hey Steve, I got to check more of these trick threads once in a while, going to get back on my 4V project too this summer. aswracing, are the rockers rollerized at all on these heads?